More FREE knitting patterns on my home page!! Difficulty Level: Experienced (use of short row shaping, and herringbone braiding � but don�t be afraid to try it, as I have tried to explain how to do both in the instructions). Materials: 16-inch circular knitting needle, size 6; cable needle; 1 skein (6 oz.) Red Heart TLC Baby, white; three 3/8 buttons; stitch marker; small amount of 1/8-inch ribbon. Gauge: 5 � sts/inch in stockinette stitch. Picking up the wrap: Slip the wrapped st to the right hand needle, and lift the wrapped thread with left hand needle and place on the right hand needle next to the wrapped stitch, then purl them both together. Inc � increases are made by purling into the front and back of a stitch. Row 1 (right side): p4, sl 2 sts to cable needle and hold in front of work, k2, k2 from cable needle, k2, p4, k1, yo, k2 tog. Row 2: k7, p6, k4. Row 3: p3, wrap next stitch, turn; k3, turn; p3, pick up wrap and purl, k2, sl 2 to cable needle and hold in back, k2, k2 from cable needle, p1, wrap next st, turn; k1, p6, k4, turn; p3, wrap next st, turn; k3, turn; p3, pick up wrapped st and purl, sl 2 sts to cable needle and hold in front, k2, k2 from cable needle, k2, p1, pick up wrapped st and purl, p2, k1, yo, k2 tog. Repeat rows 2 and 3 (20 times) until there are 22 eyelets at neck edge. End with row 3. Bind off knitwise (wrong side) on next row. Cut a length of yarn about 2 yards long and set aside for Herringbone Braid. Pick up 129 sts along bottom of yoke as follows: *pick up 1 st in ends of first three rows, skip 1 row, rep from * across, ending by picking up 2 sts in last row. 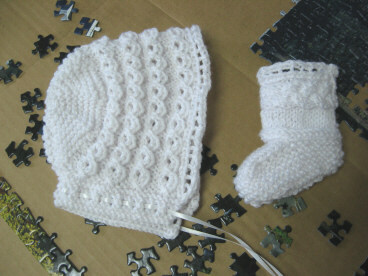 It is worked as follows: knit 1st stitch with attached yarn, then knit 2nd stitch with cut length of yarn you set aside. *Bring attached yarn underneath cut yarn and knit next st, bring cut yarn underneath attached yarn and knit next st, rep from * across. Repeat on next row, except purl each stitch instead of knitting � continue to bring yarns from underneath on each st.
Drop extra strand of yarn at end of second row. Increase Row: (p3, inc in next st) 3 times, (p4, inc in next, p3, inc in next) across, end p4. (157 sts). Row 1 (right side): (p5, sl 1 wyib, k2, psso) across, end p5. Row 2: (k5, p1, yo, p1) across, end k5. Row 3: (p5, k3) across, end p5. Row 4: (k5, p3) across, end k5. Work in established patt across 24 sts (don�t forget to count the slipped sts that are passed over the others � they still count in the stitch count!) These sts will be the Right Back. Break yarn, leaving a long tail, about 1 yard. Work in patt (with 8 sts between cables) for 2 repeats, then work rows 1 and 2 again. Decrease Row 1: p3, *(p2 tog, p1) 2 times, p2 tog, k3, rep from *, end p3. Eyelet Row: k1, (yo, k2 tog) across, end k1. With long tail from Right Back, pick up 6 sts from underarm of sleeve just worked, then work across next 51 sts for Front. Drop tail. Attach new yarn for second sleeve and work same as first sleeve. Pick up tail again, pick up 6 sts from underarm of second sleeve, then work remaining 24 sts of Left Back. Work row 2 of Patt (be aware that there will be 6 sts between cables at underarms). Joining and Increase Row: Using Cable Cast on, cast on three sts. Place a marker. 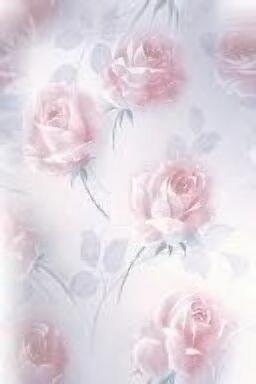 *k3, inc in next, p4, inc in next; rep from * around to marker (EXCEPT!!!! Skip one inc at each underarm to make patt even at with 7 sts between each cable). Continue in set patt, working in rounds, changing knit sts to purl and purl sts to knit on rows 2 and 4 of patt. Make increases in skirt as follows: inc in purl st on both sides of every cable. Work 12 rounds, then inc in the same way again. Work 16 rounds, then inc in the same way again. Work 24 rounds, then inc in the same way again. Remove marker. K2, p7, replace marker. Round 1: * p6, k2 tog, yo, k2 tog, yo, ssk, p5, rep from * around. Round 2: * p5, k2 tog, yo, k1, k into front and back of next st, k1, yo, ssk, p4, repeat from * around. Round 3: * p4, k2 tog, yo, k6, yo, ssk, p3, rep from * around. Round 4: * p3, k2 tog, yo, k8, yo, ssk, p2, rep from * around. Round 5: * p4, yo, k3, k2 tog, ssk, k3, yo, p3, rep from * around. Round 6: * p5, yo, k2, k2 tog, ssk, k2, yo, p4, rep from * around. Round 7: * p6, yo, k1, k2 tog, ssk, k1, yo, p5, rep from * around. Round 8: * p7, yo, k2 tog, ssk, yo, p6, rep from * around. Rounds 9, 10, 11, 12: Repeat rounds 1, 2, 3, 4. Round 13: * p2, k2 tog, yo, k10, yo, ssk, p1, rep from * around. Round 14: * p1, k2 tog, yo, k12, yo, ssk, rep from * around. Round 15: * k2, yo, k5, k2 tog, ssk, k5, yo, k1, rep from * around. Round 16: * k3, yo, k4, k2 tog, ssk, k4, yo, k2, rep from * around. Round 17: * k4, yo, k3, k2 tog, ssk, k3, yo, k3, rep from * around. Round 18: * k5, yo, k2, k2 tog, ssk, k2, yo, k4, rep from * around. Round 19: * k6, yo, k1, k2 tog, ssk, k1, yo, k5, rep from * around. Round 20: * k7, yo, k2 tog, ssk, yo, k6, rep from * around. Button Band: On Right Back opening, pick up 22 sts. Knit 4 rows. Bind off knitwise. Buttonhole Band: On Left Back Opening, pick up 22 sts. Knit 2 rows. Buttonhole Row: k3, yo, ssk, (k6, yo, ssk) twice, k1. Knit 1 row. Bind off knitwise. Weave 14-16� length of ribbon through eyelets on each sleeve, and tie in a bow. Row 1(right side): (p3, sl 1 wyib, k2, psso) across to last 5 sts; p2, k1, yo, k2 tog. Row 2: p3, k2, then (p1, yo, p1, k3) across to end. Row 3: (p3, k3) across to last 5 sts; p2, k1, yo, k2 tog. Row 4: p3, k2, then (p3, k3) to end. Repeat rows 1-4 until piece measures 12 inches, ending by working row 1. Bind off on wrong side. Pick up 72 sts along side of bonnet opposite the eyelets. Knit one row. Row 1: (k7, k2 tog) across. Row 3: (k6, k2 tog) across. Row 5: (k5, k2 tog) across. Row 7: (k4, k2 tog) across. Row 9: (k3, k2 tog) across. Row 11: (k2, k2 tog) across. Row 13: (k1 k2 tog) across. Row 15: (k2 tog) across. Break yarn and thread through remaining sts with a yarn needle. Pull tight, and sew crown together in a circle, leaving bottom edges at sides free. With right side of bonnet facing, pick up 45 sts along bottom edge of bonnet between eyelet rows. Eyelet row: k1, (yo, k2 tog) across. Bind off knitwise on next row. Cut a 24-inch piece of 1/8" wide ribbon and thread through eyelets at bottom of bonnet. 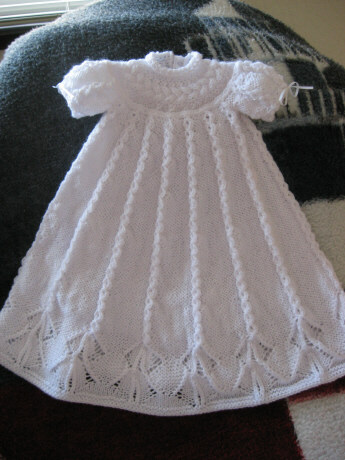 With size 6 needles, cast on 19 sts. Row 1: Knit 9, place a marker, k1, place a marker, k9. Row 2: Knit 1, knit into front and back of next st (inc), knit to marker, increasing in last stitch before marker, slip marker, k1, slip marker, inc in next st, knit to last two stitches; inc in next stitch, k1. Row 1: sl 1, purl 7, p2 tog. Row 1: sl 1, knit 7, ssk. Repeat these two rows 5 more times. Knit remaining sts on left hand needle. Work Herringbone braid same as for dress over next two rows. Work in st st for 6 rows. Bind of purlwise on next row (wrong side). Row 1: p1, sl 2 sts to dpn and hold in back, k2, k2 from dpn, k2, p2, k1, yo, k2 tog. Rows 2 and 4: p3, k2, p6, k1. Row 3: p1, k2, sl 2 sts to dpn and hold in front, k2, k2 from dpn, p2, k1, yo, k2 tog. Work in set pattern until piece measures 5 inches (or width of top of bootie). Sew cable to top of bootie with eyelets at top of bootie, using mattress st.
Sew back seam and sole .